We are pleased to announce that our Hotel & Home Studio has received First Place in the Historic Preservation category of the 2012 ASID IDEA Awards for their work at the Robert H. Smith Center at Montalto. Overlooking Monticello, on the adjacent hill known as Montalto, the Repose house was built c. 1903 for a Philadelphia land baron, J. A. Patterson. The current rehabilitation of the house creates a world-class extension of the Robert H. Smith International Center for Jefferson Studies. Repose has been adapted and expanded to provide for multiple new functions and event space. 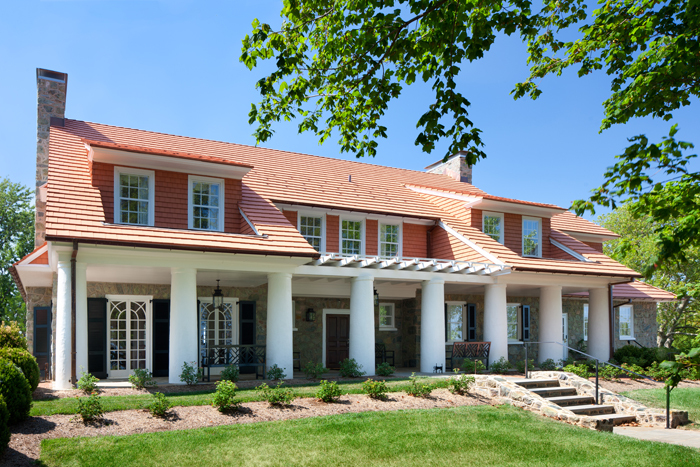 Work at Montalto included a complete restoration of the interior and exterior, the design of two sympathetic additions, incorporation of new systems, infrastructure and technology, and the interior design and selection of all furniture, fixtures, and equipment. The new facility also houses the executive Board Room for the Thomas Jefferson Foundation. The house had retained much of its original fabric in terms of millwork, plaster walls, and heart pine flooring. These elements informed the design palette of period appropriate furniture and textiles. Two original furniture elements were returned to the house during the design process, a tall-case clock and an ornately carved presentation chair, and now once again occupy the main entrance hall. The team carefully studied the physical evidence of the house as well as the documentary evidence of the period photographs and developed a lighting program that emphasizes decorative lighting with a minimal approach given to integrated, more commercial, lighting types. Media was also carefully woven into the extant fabric of the dwelling to allow rooms to function as lecture and seminar spaces without compromising the desired residential design aesthetic.